Gil, Bruce and I joined Carpo with a view to finishing off making the new boiler tube. When we looked at the end that we had opened out on Saturday, we decided that it was good, but it wasn’t Carling. So, we cut it off and started again! This time, Carpo heated a narrower area of tube before we hit it, thus avoiding any deformation above the bit we were trying to open out. Also, we did the hitting on the horizontal, which gave us much better control over the angle of the pipe (90°) against the immovable object (i.e. shed wall). 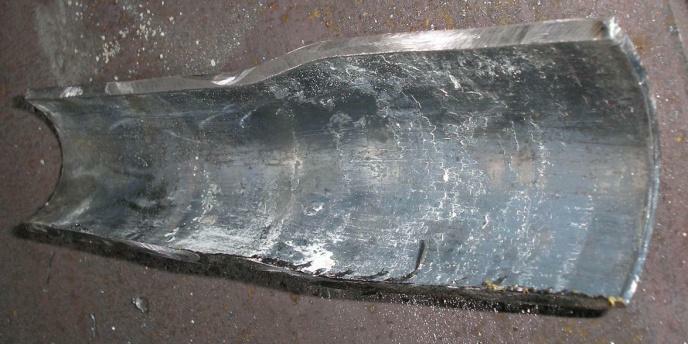 Checking the wall thickness of the old bit, Carpo declared it good. It does not thin out significantly. 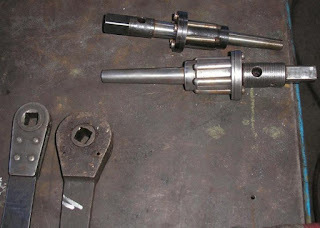 In fact, the old end had worked out 30 thou greater diameter than the hole that it has to fit in (which was another good reason for starting again!). 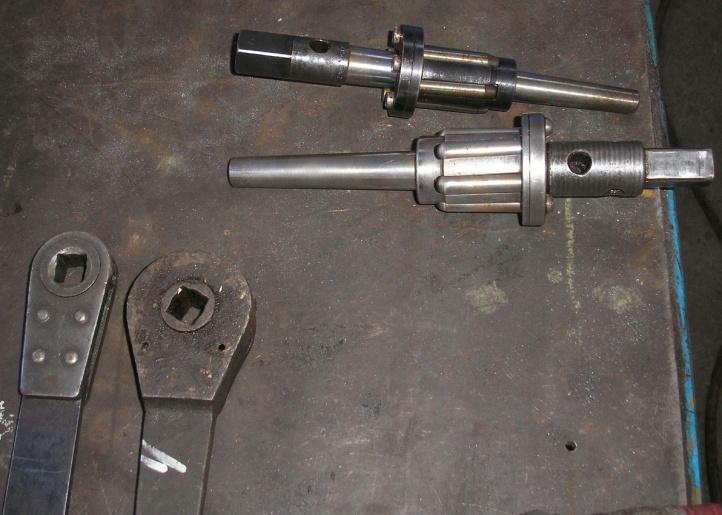 Bruce machined down the ‘slug’ so that it was an acceptable fit this time. The new end looks really smart. Carpo annealed the other end, and we had a cuppa while it cooled. 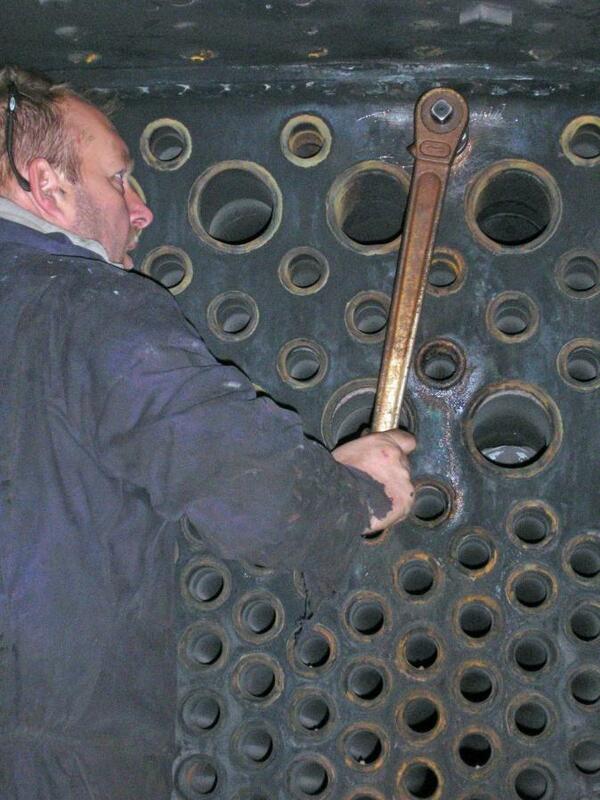 Then we cleaned both ends of the tube and the holes in the two tube plates. 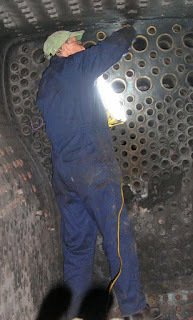 Tricky to see what you are doing when it is that high in the firebox. Well there was no stopping us now, so in went the tube. 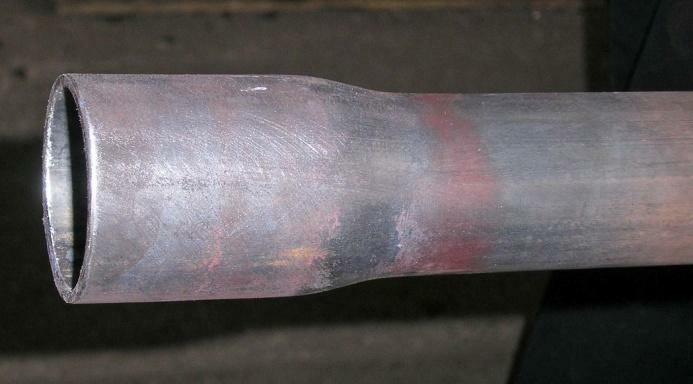 You can see how tight it was to get the tube under the superheater header. 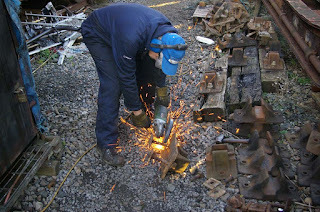 Some waggling was needed to get it beneath a cross-member at the firebox end, too. Carpo trimmed the ends, and then started swaging. 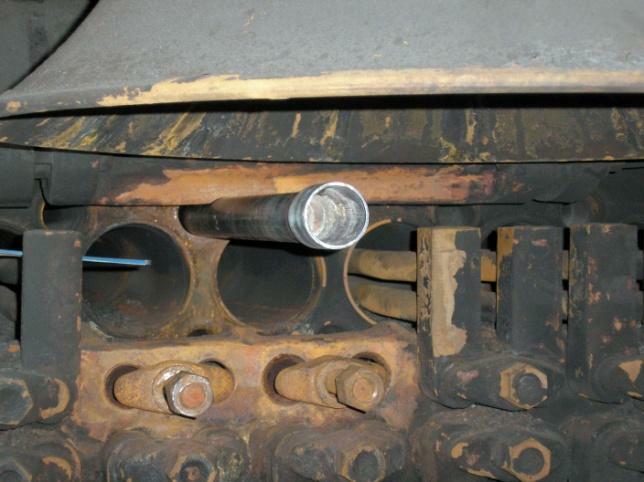 It was more troublesome at the smokebox end, partly because of the confined space, and partly because the swage could have done with being fractionally bigger. Nevertheless, after some fiddling & persuasion, the front end was done, too. “As I write this we finally have a quarter of a glass of water - ideally I would like a full glass before I switch off the tap this evening so hopefully not too long now. and some cardboard trays for boot scrapers, and there he was: in the cab, pumping up the pressure! It was at 70 psi by 11 am and no sign of leaking tubes. Today was a bit of a waiting game - not a lot we could do until the boiler inspector comes on Thursday. The plan is then to demonstrate no leaks at 100 psi (cold), followed by hastily draining the boiler and removing all inspection plugs and mud-hole doors to enable him to inspect the innards. Bruce had found a 6 metre length of reinforced hose. 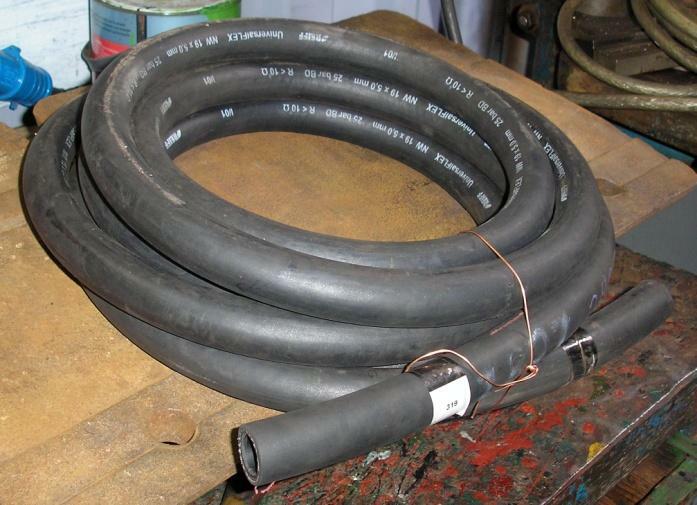 We had talked about using flexible hose for cleaning out boiler tubes several times before, and here was a chance to test the theory. Our initial design had been lengths of copper pipe, which worked well except that it is awkward attaching & removing lengths as the pipe goes in & out of the tubes; and some tubes are inaccessible with the rigid pipe. 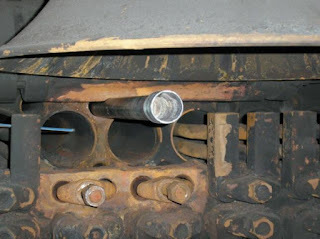 So, Bruce & I clambered into the smokebox, and I tested the ease of getting the hose into various awkward tubes - no probs! Bruce then checked the attaching of this to the end of our hoover’s hose, and has now gone away to make a small cutting piece to fit in the business end. Brian & Dixie shinned up a ladder and removed the brass bonnet from the safety valves. was paint blistering up & down the beading around the cab front. 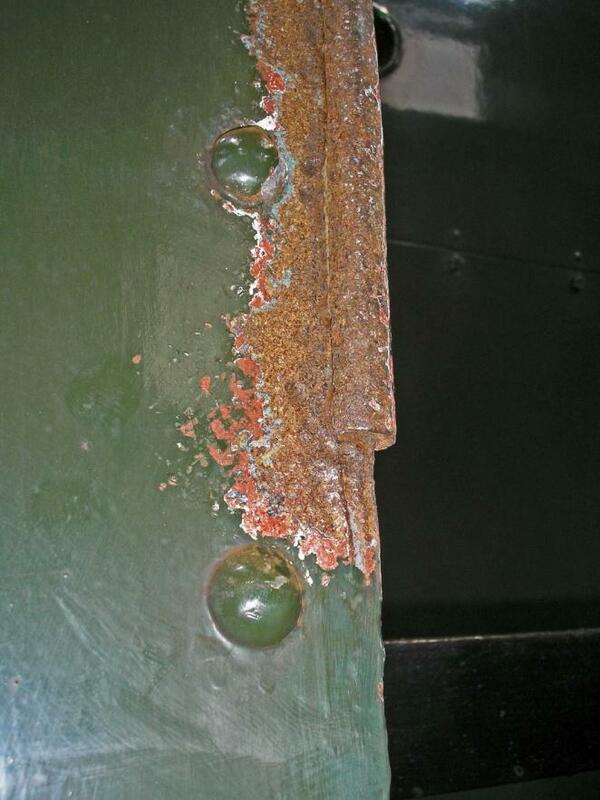 Clearly, there was a significant rust build-up underneath the beading and it deserved some attention. Brian and Dixie tackled it to begin with. Needle-gunning and then wire-brushing revealed quite a lot of rust. 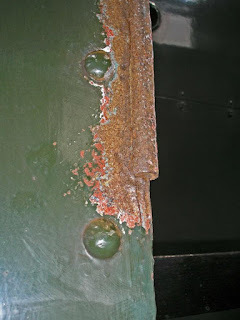 The left-hand side was worst, where the rust had opened up the beading, which was springing loose at the bottom. 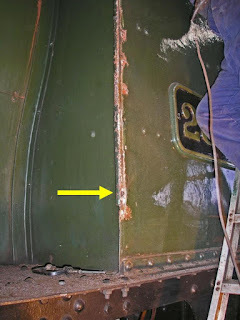 A chap who was working on the new wagon kindly did a tack-weld for us, which held the bead steady (but also burnt through the thin cab side panel!). 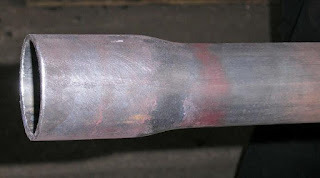 I found a tin of filler … but the hardener had gone AWOL, so Gil pootled off to Winchcombe to borrow some filler from Fred who uses it on the siphon restoration. The chaps then cleaned up the area and applied a first layer of filler. Meanwhile, I had adjourned to our container to complete more boot scrapers. Bruce arrived first and got everything ready. 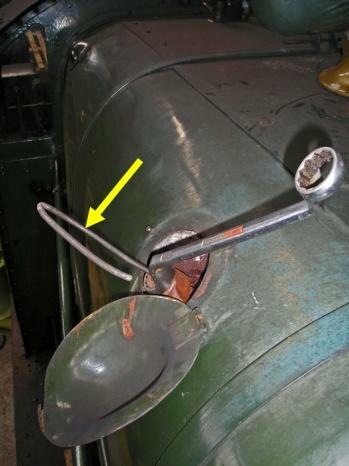 Meanwhile, Carpo demonstrated the boiler under pressure to the inspector. This was declared good, and pressure was released, followed by draining the boiler. 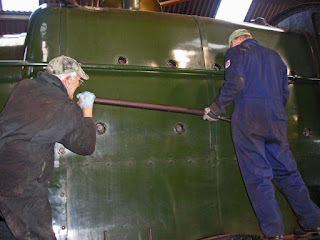 Gil arrived, and the two of them removed the safety valves and then moved on to removing boiler plugs. Viz left: Bruce fits spanner to plug; Gil applies brute force to undo it. walkabout on its own inside the boiler. Then I helped remove other plugs. 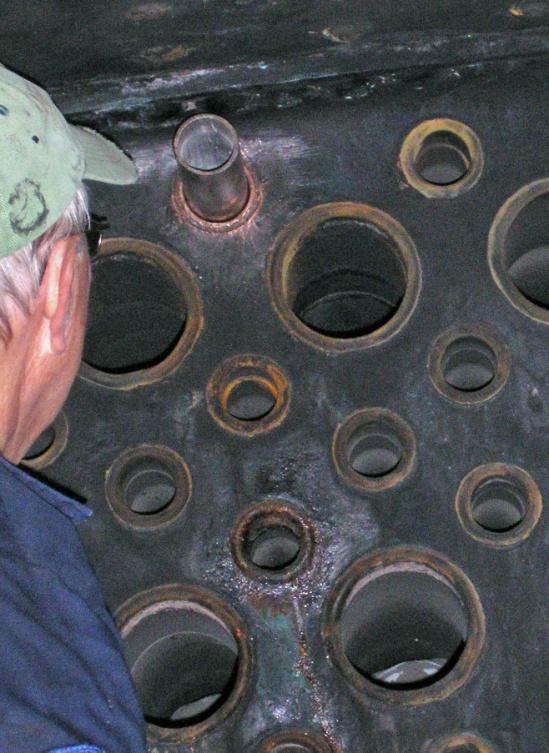 The inspector inspected the inside of the firebox; peered into various holes, and seemed quite pleased with what he saw. So, the next steps are to wash the boiler out; box it up again (i.e. 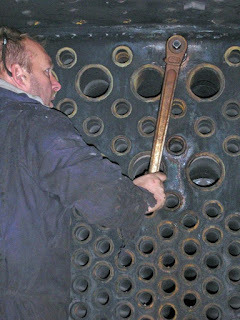 plug the holes) and then do a steam test. But not this week! Saturday is cancelled!